“Constant connectivity is one of the worst disruptions to our focus and productivity.” So says Chris Bailey, author of Hyperfocus: How to Be More Productive in a World of Distraction. It’s another book by a productivity guru that aims to help us cope better with daily distractions. Does it live up to expectations? The verdict is mixed. Well, yes. But how, and who decides? Such highly subjective personal decisions would seem to be beyond the ambit of a one-size-fits-all advice book. Its advice feels like piling on more work to an already overfull plate. Bailey begins by offering seven practical ways to focus more deeply while reading, a pastime he neglects to mention is already in steep decline. His tips run from the obvious (“put your phone out of sight,” and “turn off all notifications” that aren’t “absolutely necessary”) to strategies that ask for greater commitment (make a “distractions list”). Sidebars populate the pages, prescribing exercises that few readers are likely to do. Filling out a personal 2 x 2 grid of productive vs. unproductive work, and unattractive vs. attractive tasks could just be too much work—and thought—for an already distracted mind. In circular thinking, he advocates apps for cutting you off from distractions caused by too much technology in the first place. The author’s credentials also struck this reader as problematic. Bailey is a self–defined “productivity expert.” He does not list any credentials other than being a business graduate who turned down job offers in order to spend a year conducting “experiments where I use myself as a guinea pig.” And then, judging by his website, promoting himself in as many outlets as would take him. He confuses being an amalgamator for doing real research. “I spoke to the world’s foremost attention researchers to get to the bottom of why we get distracted so easily,” and then set out to find ways to get “our stubborn minds” to focus in this distraction filled world. Psychology has known for a long time that repeatedly shifting out attention degrades performance. 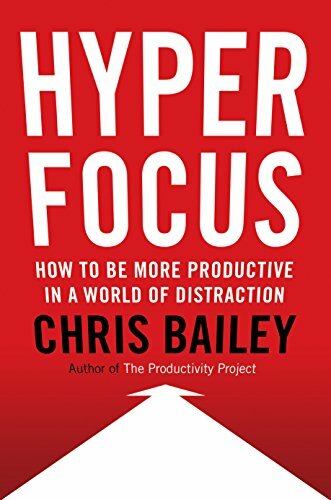 Yet Bailey’s main claim, which he presumes is original, is that by focusing deeply on just one important thing at a time, what he calls “hyper focusing,” we become “the most productive version of ourselves.” This only confirms the established fact that we are not good at multitasking. Bailey’s concept of hyperfocus boils down to this: “Keep one important, complex object of attention in your awareness as you work.” Variations of this theme are repeated throughout. The book is further littered with figures that don’t add much to the text. Most annoying are recurring diagrams of circles with arrows pointing here and there. After 130 pages, Part II begins, dedicated to the concept of “scatter focus.” Despite 100 additional pages it was difficult to understand what this anti-hyperfocus was supposed to be. The book talks about directing your attention inward as in meditation. It discusses the ways your mind wanders and the common places it wanders to. More lists and exercises follow, more diagrams too, but it isn’t clear what they are meant to illustrate. The author’s best advice may be to not sweat the small stuff and get more sleep. He is right, too, that people feel overwhelmed today because we “never give our attention a rest.” And that taking a break or taking walks to wander without purpose may be one of the most productive things we do.